The simplistic curved design is contemporary, yet too basic to appeal to everybody. It offers a very specific look, with large silver grommets the only respite from that plain matte leather. The Giselle may be a little boring for some, but I think the bold colored leather saves it from this fate. Purple, red, and orange are often too much, but with nothing else fighting for attention they work here. 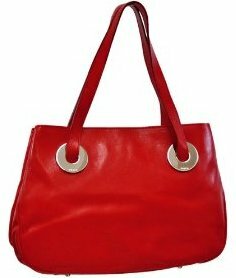 I can just imagine how striking this shopper would look paired with a black tailored suit or other neutral outfits. While the exterior may be simple, Furla hasn't skimped on the extras inside. A magnetic snap on the side walls complements the press-studded leather strap, which extends in the other direction for double security. It's an inspired safety feature, but one which may be a little fiddly for day-to-day use. But we will find value in those pockets: one for your cell and a zippered one for small valuables. The Giselle has such lovely leather, but the lack of real bells and whistles makes the $475 retail price seem steep. If you're still interested I'd act quickly while Amazon has this shopper on sale! The Furla large orange Giselle bag, a great alternative to this red bag.